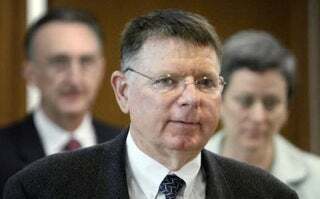 The Kansas City Star is reporting that Dr. George Tiller, who was known nationally for his controversial practice of performing late-term abortions, was shot and killed while walking into church services earlier this morning. This is not the first time Tiller has been targeted: in 1986, his clinic was bombed, and according to the New York Times, "in 1993, Dr. Tiller was shot in both arms by an anti-abortion activist while driving away from the clinic." Tiller's clinic has long been the target of pro-life activists, and he was recently charged with performing 19 illegal late-term abortions; he was acquitted of these charges in March of this year. At this time, details of the shooting are still coming out; there have been no reports of a suspect being held thus far. Update: Police are currently on the lookout for a 90s powder blue Ford Taurus with the Kansas license plate number 225BAB in connection with the shooting.